Ahmed Mekky is trending in Egypt with his new video clip "Aghla Men Al-Yaqout" in which he portrays a typical father and son theme, breaking seven million views on Youtube in one week. "I was with you the day you were born, I want you be by my side when I die," Mekky concludes his lyrics of advice and guidance to his young son. The song -- "more precious than ruby" -- is titled in reference to this is part of the lyrics, which Mekky described as such. With music produced by Shady El-Said, and written and video-directed by Mekky, the fourth single of the popular comedian's second album has gained wide appreciation for its positive message. "I am so happy the song touched you. Thank God. When I wrote it I was reflecting inner wonders and fears from days passed and days coming, in an attempt to reconcile with myself," Mekky reacted on social media, urging his fans to express their feelings towards their family members. The 38-year-old movie and TV star often tackles emotions in his lyrics, aiming to revive the forgotten values of Egyptian and Arab society in his commercial tunes. The 26-million-viewed first single, "Wa'fet Nasyt Zaman," reflected a yearning for the ethics of simple neighbourhoods like his own, El-Talbia. The song was released in early December. A month ago he released "Akhret Al-Shaqawa," featuring Mahmoud Al-Liethy, telling the story of an old penknife that couldn't save the life of its drug dealer owner, in an illustrated soft-animated video clip urging youth to eschew violence. 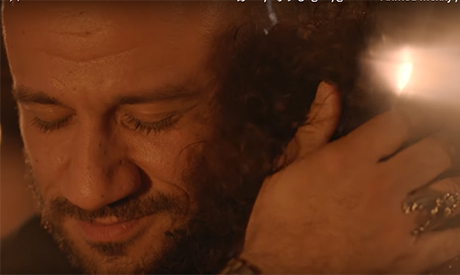 A week later, Mekky featured Nehal Nabil in "Shokran ya Mama," showing gratitude to his mother and confirming that the topics of his new album would not stray far from those of his first, "Asloh Arabi." The Oran-born artist gained fame as a comedian in his first movie as the main hero "H-Dabour," appearing originally in the well known sitcom series "Tamer and Shawkia," before playing again in Adel Imam's 2007 movie "Morgan Ahmed Morgan." Gaining wide cinema success in fantasy and spoof comedy, the half-Algerian star's most known movies are "Teer Enta" in 2009 and "La Taragoa Wala Esteslam" in 2010. Social media memes continue recycling shots from its scenes, especially after the success of its TV screening. Mekky is also known for his five-season TV series "El-Kebeer Awi" in which he presents various characters introducing actors and top stars, including Donia Samir Ghanim, Bayoumi Fouad, Mohamed Sallam and Mohamed Shahin. Mekky started his movie career as director of "El-Hassa El-Sabaa" in 2005, a long remake of his Cinema Institute graduation project. Despite it didn't gain box office success, the film still stands for its different comedy style. Despite his lack of musical background, Mekky appears confident about his steps in his self-funded music project, with the rest of his album promising still more success.